Office 2.0 Reviews: VMWare and EC2 - a perfect marriage? 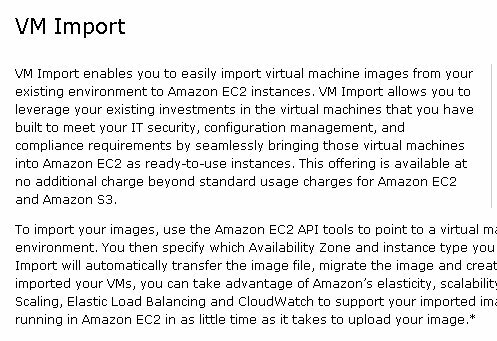 Earlier in the week Amazon announced ability to import a VMWare virtual machine. The press didn't seem to give it that much air time but I think it could be the game changer. So far EC2 has been mostly confined to proof-of-concepts, developments, and smaller projects, and it's been pretty successful at that, however they've been lacking serious customers hosting serious systems. Well, that's about to change.. VMWare image import capability means is that an IT system administrator can take any server that's already running on a VM and either move it to EC2 with one fell swoop or create a backup / hot swap / mirror of it using EC2. For an IT admin being able to do this quickly is a huge deal! And for EC2 this might be a perfect transition path strategy.